800W power inverter with pure sine wave output can convert DC voltages (12V/24V/48V) to AC voltages (110V/120V/220V/230V/240V) for home and car use, with USB port and universal outlet, to give your device or equipment safe and stable power. High power inverter with 1000 watt output power and 2000 watt peak power features wide selections of input & output voltages (12/24/48V DC to 110V/220V AC), full safety protection, LED display, built-in fuse and cooling fan, to power your device at home or outdoors safely. 1200 watt pure sine wave power inverter is ideal for home and car use, converting DC 12V/24V/48V (optional) to AC 110V/120V/220V/230V/240V (optional), 50/60Hz, with full protection of under and over voltage, overload, overheat, short circuit. Pure sine wave power inverter provides 2000 watt continuous power and 4000 watt peak power, converting DC 12/24/48V to AC 110/120/220/230/240V with high efficiency and full safety protection to power your device. 3000W pure sine wave power inverter has selectable DC 12/24/48 volts input, and AC 100/110/120/220/230/240 volts output, 50/60Hz, widely used for car, home and solar to power your devices, high efficiency, durability and safety. 800 Watt pure sine wave power inverter has various options of input voltages and output voltages for sale with full safety protections, ideal for charging cell phones, laptops, small TV, MP3 players, refrigaretor and other home appliances. Tips: Why a 300W power inverter connected to a car cigarette lighter can’t get a desktop computer start up? It is not recommended that you take power from the cigarette lighter to charge more than 120W electrical appliances. The cigarette lighter can only withstand about 10A current and about 100W power, because there is about 2-meter wire connected the battery to cigarette lighter, and the negative polarity of battery is connected to the car shell, causing too much loss of voltage and current. The inverter will not start up when it detects that there is no enough voltage and current to maintain its work. The inverter's best operating voltage is 11-13V. 1. Change thicker wires from the positive and negative polarity of battery to the cigarette lighter. 2. 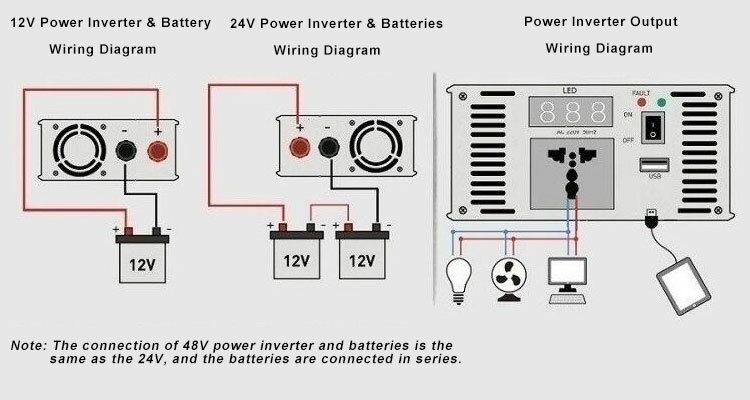 Connect the original battery connection clip line of the inverter to the positive and negative poles of the car battery, thus electrical appliances within 300W can be started. In this video, ATO show you the testing of 1000W pure sine wave power inverter, 24 DC to 220V AC. Furthermore, this power inverter is used to charge a fan and cell phone.